Varicose Veins are veins that become abnormally swollen and large, usually due to defective valves in the vein. Varicose veins are sometimes bluish in color, protrude from the surface of the skin, and frequently have a winding or worm-like appearance. Can I be cured of my varicose veins? Varicose veins are a problem that can be successfully treated but the disorder cannot be permanently cured. The treatment of the abnormal veins does not remove the original tendency of a patient to develop varicose veins. Therefore, many patients need to return for maintenance treatments after their initial treatment is completed. How will the blood in my veins get back to my heart after all of the abnormal veins are removed or destroyed? The backward flow of blood in varicose veins and main superficial trunks, the great saphenous vein (GSV) and shorter saphenous (SSV) vein actually interfere with the normal venous return of blood. Removal of these areas of abnormal circulation actually improves circulation of blood in the treated limb. It is this improvement in limb circulation that causes improvement of symptoms to the limb. Do I have to treat both legs? The abnormal limb or limbs should be treated thoroughly for best results. They may be treated at the same time or after one another. What is a skin ulcer? A skin ulcer is caused by a venous reflux disorder that is called a venous stasis ulcer. Early signs that a venous stasis ulcer may develop include a darkening of the skin in the area of the ankle. Gradually, the skin may become leathery or waxy in appearance. Without treatment of the venous disease, the skin may breakdown and bleeding may occur. What is a duplex ultrasound examination? The venous duplex examination permits your phlebologist to see the anatomy and check the flow characteristics of the veins beneath your skin. Useful information is gathered that your physician can use to adequately diagnose your specific vein problem and to plan and guide treatment. Sclerotherapy is the treatment of varicose veins by injection of the veins with chemicals that cause destruction of the veins. Many patients who select this treatment option for cosmetic reasons notice improvement in the way that their legs feel after treatment. What new treatment options exist for patients who have abnormal blood flow in the major vein trunks other than vein stripping? In order to control the backward flow of blood in these large veins, the vein that is the source of the visible varicosities must be sealed shut or removed. The vein may be sealed shut using energy sources such as a laser, or radiofrequency energy electrical energy, or by ultrasound guided sclerotherapy injections. I was told that varicose veins are just a cosmetic issue, but my legs ache and feel heavy. Can varicose veins actually cause problems? Absolutely. In addition to causing pain, heaviness and fatigue, varicose veins left unattended can progress to chronic venous insufficiency or CVI. CVI can cause swelling, discoloration and even ulcers to develop. We recommend treatment at its earliest stages, before more serious complications develop. What is ultrasound guided sclerotherapy? Visual sclerotherapy refers to injection of surface veins that are visible to the naked eye. Some veins that need to be treated are below the surface of the skin and cannot be injected safely without the aid of ultrasound imaging assistance. Vein treatment programs are designed to treat visible varicose veins and to treat abnormal veins that may not be visible but that may be the source of the visible varicosities. If varicose veins are the only abnormality detected by the treating physician, the treatment involves the injection of chemicals (sclerosants) into the vein (sclerotherapy). Do treatments hurt and are there side effects? Dr. Morgan’s skill and experience in performing vein procedures keep discomfort from treatments low. Your treatment is performed in our comfortable office setting. Patients can drive themselves to and from appointments and walk immediately after treatments. Temporary bruising is the most common side effect. Serious side effects are possible with any medical procedure, but compared to traditional surgery, serious side effects are rare with our advanced techniques. Will there be restrictions in my activity after the procedure? Will I miss time from work? No. Rather than restrict your activity, we encourage daily walks and exercise. Downtime can vary; however, most patients return to work the same day. Why can’t I just have the branches injected or removed if the main superficial trunk is abnormal? For the treatment of the visible veins to last a long time, the source that may not be visible to the naked eye must be controlled as well. From a practical standpoint some insurance carriers will not pay for treatment of branch varicosities if an abnormal main trunk is not treated at the same time or before the branches are treated. Why do doctors recommend gradient compression stockings? The properly fitted gradient compression stocking can temporarily reverse the effects of vein disease and lessen the discomfort as well as skin damage. Many insurance companies require a trial of stocking use before approving procedures. Does insurance cover my vein procedures? All major insurance companies recognize vein problems as a medical condition. Depending upon your policy and your physical signs and symptoms, your vein procedures may be a covered benefit. Vein clinics seem to be popping up all over town. Yet, why do many travel a distance to be seen at Lone Star Vein Center? Some doctors may offer vein treatment as a sideline procedure to their patients. 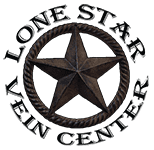 At Lone Star Vein Center, vein care is the sole focus of our practice. Our state-of-the art facility is equipped with the latest laser and ultrasound technologies. From the smallest spider veins to advanced leg ulcers, we offer the most complete vein treatment anywhere.